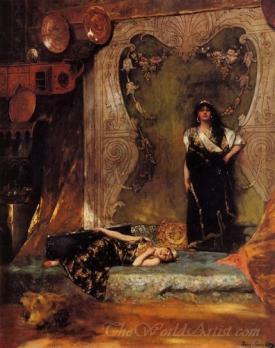 Benjamin Constant was a student of Alexandre Cabanel when he studied at the Ecole des Beaux-Arts in Toulouse. 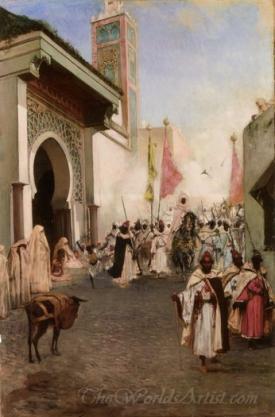 An excursion to Morocco in 1872 strongly affected his early artistic development and he started to paint Romantic scenes in an Orientalist manner. Among his prominent works in this vein are Last Rebels, Justice in the Harem, and Les Chérifas. His expansive canvas, The Entrance of Mahomet II into Constantinople, won a medal in 1876. 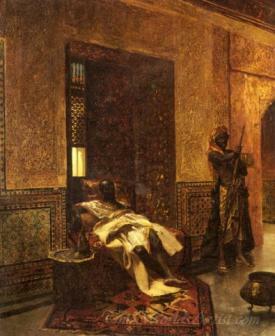 After 1880, Benjamin Constant changed directions, committing himself to painting mural and to portraits. Prominent examples include the great plafond in the Hôtel de Ville, Paris, entitled Paris Convening the World. In England, Benjamin Constant was a respected and distinguished portrait painter and a favorite among the aristocracy. 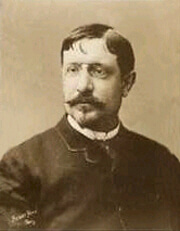 His portrait Mons Fils André was awarded a medal of honor at the Salon in 1896. 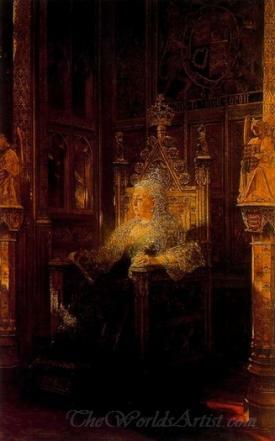 Benjamin Constant painted Pope Leo XIII. He was made a member of the Institute in 1893 and was a commander of the Legion of Honor. He visited the United States several times and painted many of portraits. 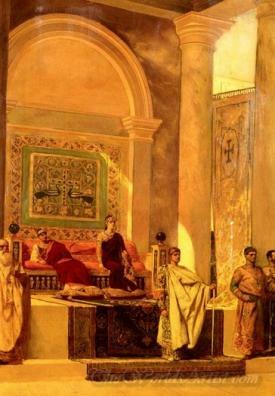 The Metropolitan Museum of Art in New York owns a large mural decoration by Benjamin-Constant entitled Justinian in Council. Benjamin Constant additionally was an essayist of fame, contributing various studies on contemporary French painters. 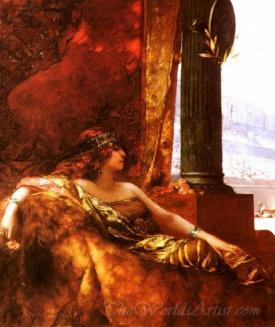 Artists Influencing Benjamin Constant: Alexandre Cabanel, Jules Garipuy, Eugène Delacroix. He Traveled To Morocco, England, USA, Spain, Canada. Benjamin Constant Hand-Painted Oil Painting Reproductions. Benjamin Constant Museum Art Replicas on Canvas.